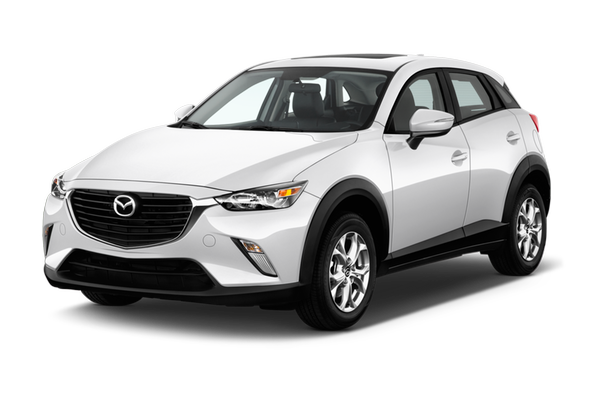 The 2016 Mazda CX-3 Grand Touring AWD Review: Subcompact crossover vehicles are cropping up everywhere this year, including one that puts Mazda’s unmistakably fun-to-drive spin on the category. It’s called the CX-3, and it is, by a long shot, the most engaging car to drive in this burgeoning class. While competitors all have their own strong points, like the cute Italian styling on the Fiat 500X, the comfy highway ride of the Chevrolet Trax or the logical, solid cabin in the Honda HR-V, none of them are the kinds of cars an enthusiast driver could take seriously. The CX-3, though, seems like a rational place to land when a true sports car will no longer do the job. To me, it feels vaguely like a Miata with a back seat. It’s not particularly fast, but it does leave the impression of speed thanks to quick reflexes and perfect steering sensitivity. You can’t get a stick-shift in it, oddly enough. You’d think Mazda, of all companies, would make a manual transmission available, but your only choice is a six-speed automatic. It does a good job with quick shifts and never hunts for gears, but still, you have to wonder how much more heavenly it would be with a manual. Power comes from a 2.0-liter, four-cylinder engine that feels much better than its 146-horsepower figure would suggest. It’s almost eerie how good Mazda is at squeezing the sensations of speed from small, very fuel-efficient engines. 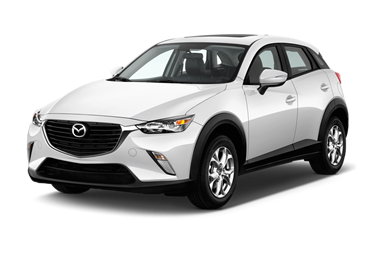 With front-wheel drive, the CX-3 is rated for 29 mpg in the city and 35 on the highway. When you opt for all-wheel drive, those numbers drop to 27/32, which is still very respectable. I think the styling, with one notable exception, is absolutely stunning. A sharp, angular nose blends nicely with muscular fenders and a sloping roofline to make it look like it belongs on the varsity team when most cars in this class should be on JV. The exception is the black plastic trim that surround all four wheels. Those plastic humps bring back bad memories of ‘90s SUV body cladding for me, so I wish Mazda made a version that replaced them with body-color trim instead. As a whole, though, this car has a sense of style that seems impressively thought-out and original for something that starts under $20,000. Mazda deserves props for being bold. It’s also stepped surprisingly far out on a limb with its option sheet, offering features that don’t normally show up in affordable little cars. My CX-3 tester came with a heads-up display, radar cruise control and a Bose premium audio system, for example. One feature that tickles my nerdy bone is the ability to customize the lane-departure warning sensitivity and sound. If you’re somebody who’s ever had to turn off this safety feature off because it gets annoying, beeping at you for drifting ever so slightly out of your lane, simultaneously reminding you that you’re a less-than-perfect driver, you’ll love what the CX-3 lets you do. You can set the sensitivity of the warning to suit your needs, so it could only warn you after you’re starting to cross the center stripe, for example, instead of just drifting closer to it. And you can choose what sound you want to hear and how loud it should be, almost like setting the ringtone on your cell phone. I’d never noticed that feature on another car and wouldn’t have expected to find it on such an affordable model. Pricing starts at $19,960 for the Sport trim and ranges up to $24,990 for the Grand Touring with leather, navigation and Bose audio.